Bella Mente and Ran. Image copyright Talbot Wilson. Ran and Bella Mente. Image copyright Talbot Wilson. Rambler (big) and Carina (small). Image copyright Talbot Wilson. Bella Mente leads Ran. Image copyright Talbot Wilson. Five 3-boat teams were formed to compete for the Onion Patch Trophy. Coming first was the New York Yacht club team of Sforzando, Rambler sailed by George David (Hartford. CT) and Bella Mente. The Naval Academy Sailing Squadron... Flirt, Swift and Invictus... came second. The Storm Trysail Club Red Team… Carina, High Noon and Gold Digger... was third. 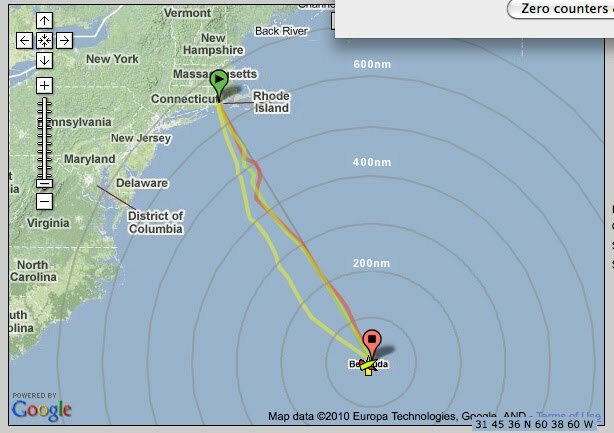 The iBoattrack showing the courses taken by Sinn Fein (yellow), Carina (dark yellow) and Speedboat (orange). Doing it right. “That’s the way it should work,” said a sailor who heard about one of these incidents of owner-stimulated reverse redress. (1) When Scott Bearse saw his Slide Rule listed as Class 4 IRC winner, he advised race chairman Bjorn Johnson that something was wrong, saying, “I sailed a good fourth-place race, not a first-place race.” Scorer Brin Ford found a typo in the rating certificate and Slide Rule slid to third. (2) Erwin Wanderer was so certain that his Ocean Wanderer 1 finished 33 minutes later than the finish line committee believed that he insisted that the recorded time be changed at the cost of a position in the Double-Handed Division. Champagne conditions. Rán’s blog had this representative rave: “We have a calm sea and an endless horizon. Nothing else in sight, just blue water, perfect temperature, beautiful sunshine. What else could we ask for?” Adding to the enjoyment was the spectacular wildlife. Navy midshipmen in Invictus counted a tuna, some sharks, many dolphin, lots of Portuguese men of war, and a sea turtle. Other boats saw whales, sometimes in pairs. Turning point 1. A hole on Day 2 left boats in the middle doing doughnuts while a few crews on the sides found new breeze. Carina improvised a quick escape that navigator Patricia Young must have had in mind when she told Thursday’s Navigator’s Forum, “Carina’s iBoattrack’s movie file looks a great deal more even than what we experienced.” The boat’s navigator for many years of high finishes, Clark is the first woman to win the race’s George W. Mixter Trophy as navigator of the winning boat. Turning point 3. Oceanographer Jenifer Clark hit the nail on the head when she opened her pre-race briefing, “The 2010 Newport Bermuda Race should be a dynamic event this year with respect to ocean currents.” The area between the Stream and the island has acquired the ironic nickname “Happy Valley” because so many dreams of glory have been shattered there. Dorsey Beard of Esmeralde described its currents: “Some from the east, some from the south – but foul every which way.” There was less chaos near the rhumb line. Swinging for the fences. Generally speaking, east was best. First to finish Speedboat went pretty straight near the rhumb line, as did Carina and Clover III, top boats in the St. David’s and Cruiser Divisions. But one high-finishing boat did a bold end run to the west. Peter Rebovich early on was faced with a choice: Should Sinn Fein cover the other Cal 40s – Doug Jurrius’ Belle Aurore and Bill LeRoy’s Gone with the Wind? Or should he observe Richard Nye’s “swing for the fences” rule? 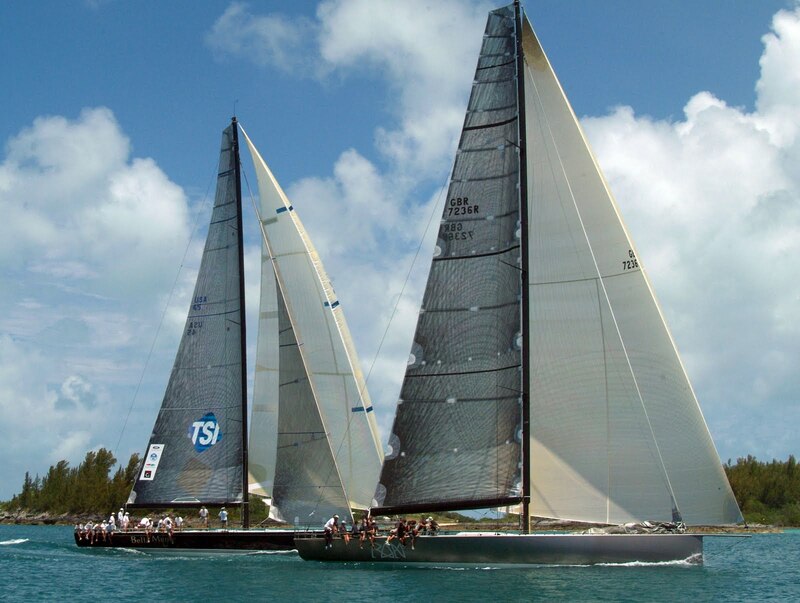 A faint heart had not won Pete two straight Bermuda Races. He ventured 50 miles west of the rhumb line and reached down to the finish at 8 knots under his big asymmetrical over a staysail while the boats to the east were under Code Zeros or genoas. Despite half a knot of foul current for the last 90 miles, Sinn Fein ended up second in Class 1 and seventh overall. 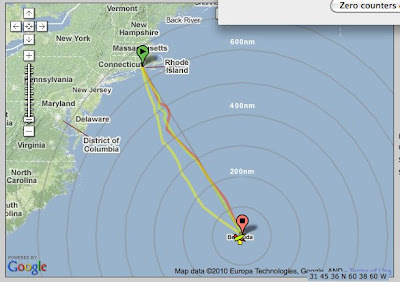 To appreciate the options, go to iBoattrack and select boats at Boat Mapper. Amazing Repair 2. Seven minutes after the start, Snow Lion’s new mainsail blew out, making the sail unusable unless a reef was tied in. Larry Huntington’s crew closed the rip with tape and reinforced the sail by sewing in sail stops radiating out from the clew. Dozens of man hours went into the repair using old-fashioned sailmaker’s needles, waxed twine, and palms (they had two of them because Steve Lirakis always carries a palm in his seabag). Snow Lion ended up second on corrected time in the Gibbs Hill Division. Band of brothers. Double-handers John Ryan of Bolands Mills and Michael Hennessey of Dragon greeted each other with a warm hug after match-racing for 635 miles. Editorial policy. Unlike a newspaper or magazine, an online publication can easily influence the event it’s covering. Providing outside assistance that’s not available to others is a violation of Racing Rule 41. After the 75-footer Titan XV exited the Gulf Stream, crew member and website reporter Chris Museler sent us an email passing on navigator Peter Isler’s surprise that there was little southeast set in the Stream. While repeating this tidbit online surely would have entertained armchair tacticians, just as surely this would have been welcomed – and used – by at least some navigators in the 180 boats trailing Titan. So we cut it from the story, and saved it for now. SLAM Kiwi Match training off Trapani. Supplied image. It's take 2 for SLAM Kiwi Match as the team re-groups in Trapani, Sicily for the next event on the calendar, the Trapani Match Race Cup. A chance for the team to build on a solid start in La Rochelle and also a chance to convert our solid performances into a regatta win. The team takes on a slightly different shape this week with Mark Tighe from Ireland joining us and also a local legend from Palermo. Mark brings a wealth of experience with him from big boat inshore and offshore regattas right through to match racing in his CV so is sure to add a lot to the team. Our local bowman John, from Palermo, Sicily will be a great help to the team both on and off the water. There looks to be a solid field of competitors at this event with teams coming from Australia, Great Britain, Greece, Russia, Slovenia and Italy. 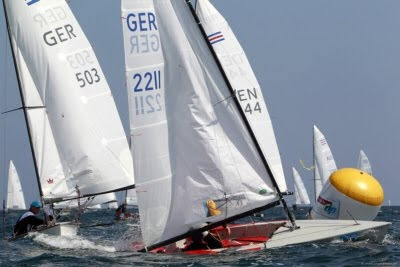 This will bring a great international flavour to the event and coupling that with the ability of the Italians to run a well organised regatta it is sure to be a lot of fun. 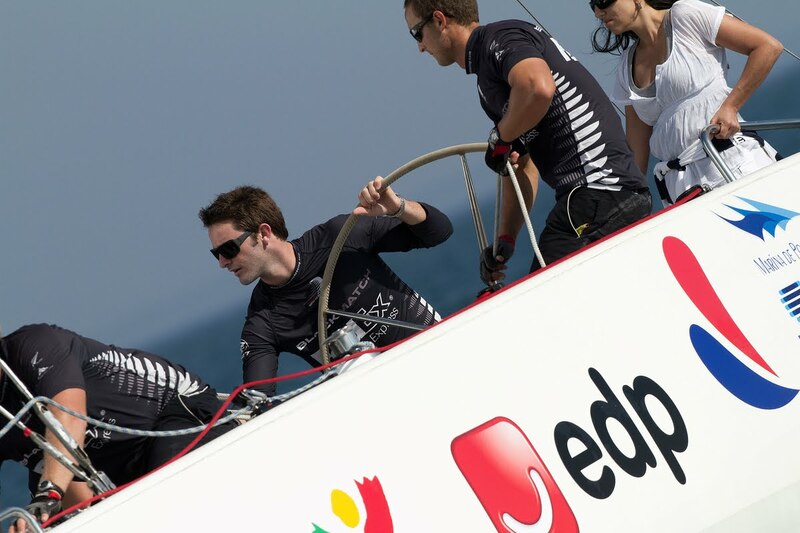 The regatta will be sailed in Zipp 25 keelboats, very similar to the Platu 25's we raced in La Rochelle. This will be helpful for us as we can re-use a lot of the tricks we learnt there to give us a head start here. Action on board Bronco. Image copyright Joy Dunigan. A great, yet fantastically challenging day of racing took place in Newport for the 2010 Layline Oakcliff Northeast Regatta, hosted by Sail Newport. Three races were held revealing John Porter with tactican Jonathan McKee on Full Throttle in first place, Jason Carroll’s Argo is second with John Baxter on tactics, and in third is Jim Swartz and long-time tactician Gavin Brady on Q.
Porter’s Full Throttle poured on the speed right out of the gate. Michael Dominguez on Bronco had a great start putting him out front early to round the windward mark in first. Porter trailed in second followed by John Taylor on Ninkasi. Downwind Dominguez held his own to round through the gate with the breeze dropping off significantly and fast. With a change of course to 000, Porter over took Dominguez for the lead for the shortened race to win. Hiking hard in Newport. Image copyright Joy Dunigan. In race two, Q took the lead early with an aggressive pin end start. The really hot contest was between Robert Hughes with tactician Charlie Ogletree on Heartbreaker and Kip Meadows on roXanne with Andy Horton calling the shots. Meadows held on with a strong second position up until the last sprint to the finish. Hughes triumphed staying more center to the course while Meadows struggled with boat speed out on the right. Better pressure put Swartz across in first, Hughes was second and Porter finished third. Bow work. Image copyright Joy Dunigan. The last and final race of the day belonged to Jeff Ecklund on STAR. From almost start to finish, Ecklund had a firm grip on the lead, or at least within sight and was determined to hold on for victory. With Bill Hardesty on tactics, STAR rounded second behind Italy’s Carlo Perrone on Atlantica 19 at the first mark. Ecklund eventually overtook Perrone for the win. Perrone settled for second, Hughes took third. After racing, teams congregated at Celeritas’ Malcolm and Kathy Gefter’s home for snacks, wine and Long Trail Beer. Daily awards were given out to the top teams of the day. Special thanks to Mac Designs and Seahorse Magazine for the cool prizes provided alongside of the classic, overall daily winner bottles of champaign. Concentration on board. Image copyright Joy Dunigan. As always, the wind conditions can be predictable or unpredictable and in the case of Superyacht Cup Day 2, they were both. Everyone bobbed around the committee boat, saying here we go again, with delay after delay and everyone expecting a simple puff of wind, just enough to fill the myriad of sails. But the race officer, even though he was warned of the typical conditions in the Bay of Palma, kept his fingers crossed and an eye of the breeze, to call an ideal start and a shortened course, starting around two-ish when the first boats crossed in front of Tigerlily of Cornwall. En-route to the first mark, we all fought to keep focused as the breeze played with our minds, saying 10 knots, maybe 12 knots, I’m not sure how much I’m going to blow today. Then after rounding, all in staggered sequence with only one or two over taking each other, on to the second mark all the way across the bay. The island surprised us and delivered a superb gust up to 18 knots, and the fleet started to move, kites went up and smiles were across everyone’s faces. The strengthening breeze kept everyone active and the fleet was really sailing, no one could complain about these perfect conditions. The late afternoon sun was shimmering across the bay and the fleet romped home after the final zig zagged mark, with an almost perfect fleet finish, all within a few boat lengths of each other, the simplest of days became heaven on earth and water. The Superyacht Cup delivered in bucket loads and the bar chat tonight will be of good sailing and relaxed racing, after all this is not a dangerous race where people feel scared or sail on the edge of technology, but a regatta where families, friends and crew all play together and enjoy what yachts are all about. In defence of the Superyacht Cup, I have to also add that if today’s racing was anything to go by, this is a perfect way for owners to really appreciate life afloat. I had the good fortune of sailing on board SY Tenaz, a family run yacht with everything you would expect, children playing on deck, mum reading the papers and dad at the helm, and at the end of the day, he thrust his arms in the air with triumphant shout, yes we came 6th, thanks gang he added, and then he, his children and the crew all laid the fenders ready and started to wash down, it truly was all hands on deck, and a true representation of what this event is all about. Good clean racing fun. Lets hope for more of the same tomorrow. Kieler Woche: Perfect Conditions for Sailing! Contender racing at Kieler Woche 2010, © segel-bilder.de /Christian Beeck. Sail as much as you can was the motto for the fourteen intrnational classes when perfect sailing conditions came back to Kiel. Up to four races for the 750 teams get to day into their results. Christopher McLaughlin (GBR) and crew took the lead in J24 with three wins and a six place discard. As well in the 29er Mads Emil Lübeck / Christian Peter Lübeck (USA) could win three races and now leading the fifty boat strong fleet. 420: 1. Damien Brenac / Julien Lacaze (FRA) 2,2,3,7; 2. Chuan Yang Ko / Andrew Paul Chan (SIN) 5,1,3,9; 3. Cassandre Blandin / Marion Leprunier (FRA) 2,2,5,9; 4. Jordi Xammar Hernandez / Joan Herp (ESP) 5,4,1,10; 5. Justin Liu / Sherman Cheng (SIN) 8,1,2,11; 6. Joanna Freeman / Hannah Mitchell (GBR) 3,1,9,13. OK-dinghy: 1. Greg Wilcox (NZL) 4,1,11,1,17; 2. Rakocy Bartosz (POL) 1,6,1,10,18; 3. Oliver Gronholz (Bad Segeberg) 6,3,2,11,22; 4. Jørgen Holm (DEN) 9,2,9,3,23; 5. Tim Goodbody (IRL) 2,13,4,5,24; 6. Andreas Pich (Travemünde) 14,4,12,4,34. Europe: 1. Sylvain Notonier (FRA) 1,3,2,4,10; 2. Anna Livbjerg (DEN) 3,1,3,3,10; 3. Stine Paeper (Hamburg) 2,8,1,2,13; 4. David Kölby (SWE) 3,5,3,7,18; 5. Tobias Hemdorff (DEN) 1,4,5,13,23; 6. Kaczmarek Marek (POL) 7,5,8,6,26. Folkboat: 1. Per Jørgensen / Kjeld Skov / Kristian Hansen (DEN) 9,9,2,2,22; 2. Christian Thomsen / Claus Schou / Henrik Holk (DEN) 1,2,7,14,24; 3. Ulf Kipcke / Gero Martens / Dieter Kipcke (Neumünster) 7,6,5,8,26; 4. Per Buch / Per Puck / Hans Schultz (DEN) 16,5,1,6,28; 5. Dirk Rohrbeck / Uwe Grigull / Sylvia Lienau (Mönkeberg) 2,14,8,9,33; 6. Uwe Pfuhl / Jens Callsen / Siegfried Busse (Laboe) 3,7,9,16,35. Platu25: 1. Martin Sigrist / Luca Gerig / Matthias Bosshart / Benjamin Dierauer / Simon Brügger / Markus Sigrist (SUI) 2,4,1,2,(9),9; 2. Daniel Nauck / Daniel Nauck / Thorben Nowak / Frank Barownick / Steve Bärtle / Thomas Piesker (Berlin) 10,(11),3,1,1,15; 3. André Teutenberg / Jan-Pit Teutenberg / Jens Wehrenbrecht / Lars Teutenberg / Sven Wehrenbrecht (Dortmund) (8),2,2,6,5,15; 4. Jens Ahlgrimm / Enrico Taeufer / Carsten Wernecke / Mathias Gedrange / Stephan Moelle (Niederstotzingen) 3,7,(13),4,3,17; 5. Ingo Lochmann / Jens Steinborn / Max Rieger / Matthias Krüger / Christian Maedel (Berlin) 1,1,(14),12,10,24; 6. Suzanne Willim / Jasmin Rupprich / Catrin Wegner / Wibke Bülle / Eva Steinijans / Charlotte Jaekel (Goltoft) 4,9,9,(10),2,24. J24: 1. Christopher McLaughlin / Julia Scott / Chris McLaughlin / Michael Kyte / Andy McLelland / Ian Southworth (GBR) 1,1,2,(6),1,5; 2. Matthias Garzmann / Michael Skotzki / Benjamin Voigt / Roland Böhm / Thorsten Glabisch (Hamburg) (11),4,1,1,8,14; 3. Peer Kock / Valentin Zeller / Marc-Daniel Mählmann / Ole Hicken / Hannes Pagel (Hamburg) 5,2,3,4,(13),14; 4. Kai Mares / Justus Kellner / Tobias Peters / Tim Becker / Jan-Marc Ulrich (Dänischenhagen) 2,7,(15),5,4,18; 5. Per-Håkan Persson / Baltzar Weinhagen / Marie Ståhlbrand / Monica Persson / Peter Nielsen (SWE) (15),3,10,2,11,26; 6. Stefan Karsunke / Andrea Körner / Tim Habekost / Jonathan Huth / Malte Gibbe (Hamburg) 6,10,(12), 9,2,27. Hobie 16: 1. Detlef Mohr / Karen Wichardt (Reinfeld) 2,1,3,6; 2. Wee Chin Teo / Justin Wong (SIN) 1,2,4,7; 3. Wen Chun Low / Jonathan Russel Chew (SIN) 4,3,1,8; 4. Jens Goritz / Katrin Wiese-Dohse (Wyk/Föhr) 3,4,2,9; 5. Knud Jansen / Anke Delius (Kiel) 5,6,5,16; 6. Georg Backes / Joshua Schütze (Kiel) 7,11,7,25. 505: 1. Dr.Wolfgang Hunger / Julien Kleiner (Strande) 1,1,2,4; 2. Jan Saugmann / Morten Ramsbæk (DEN) 6,6,1,13; 3. Meike Schomäker / Holger Jess (Kiel) 8,3,3,14; 4. goerge martin / goerge rainer (kiel) 3,12,8,23; 5. Stefan Böhm / Roos Gerald (Hürth) 4,14,5,23; 6. Jacob Bojsen-Møller / Jørgen Bojsen-Møller (DEN) 5,4,15,24. FD: 1. Szabolcs Majthenyi / András Domokos (HUN) 2,1,1,4; 2. Kilian König / Johannes Brack (Waldeck-Scheid) 1,2,4,7; 3. Bas van der Pol / Marc van der Pol (NED) 3,3,2,8; 4. Harold Wijgers / Niels Kamphuis (NED) 4,4,3,11; 5. Martin Krings / Joachim Brodda (Hamburg) 10,7,5,22; 6. Christoph Aichholzer / Philipp Zingerle (AUT) 6,10,6,22. H-Boats: 1. Mads P.G. Korsgaard / Anders Rydlöv / Uffe Dreiser (DEN) 1,1,1,3; 2. Kent Dalsbo / Michael Damborg / Claus Berno (DEN) 5,11,3,19; 3. Jesper Dietz / Torben Henriksen / Jakob Hansen (DEN) 6,6,7,19; 4. Morten Reinhold / Kim Fremlev Larsen / Chr. Milert Hansen (DEN) 3,12,6,21; 5. Jörg Dr.Thoben / Ole Jensen / Dirk Thoben (Fahrdorf) 8,4,9,21; 6. Per Hovmark / Søren Bredal / Bertelsen Anders (DEN) 12,8,2,22. Dragon: 1. Jesper Bendix / Jesper Baungaard / Lars Christensen (DEN) 1,1,6,8; 2. Ben van Cauwenbergh / Yves Bassette / Manu Hens (BEL) 2,5,3,10; 3. Mitja Meyer / Zino Soyka / Miklas Meyer (Hamburg) 5,2,8,15; 4. Tim Ladehof / Arne Brügge / Tim Jesse (Hamburg) 8,7,1,16; 5. Ulli Libor / Pontoppidan Dines / Uwe Mares (Hamburg) 4,10,2,16; 6. Thomas Müller / Mario Wagner / Tom Robin Müller (Zug) 6,6,5,17. Formula18: 1. Helge Sach / Christian Sach (Zarnekau) 1,2,1,4; 2. Jörg Gosche / Hannes Pegel (Bremen) 2,1,2,5; 3. Eckart Kaphengst / Söncke Kühl (Kiel) 4,7,3,14; 4. Frank Rübling / Martin Bach (Oststeinbek) 3,10,4,17; 5. Horst Fock / Nathan Wolf (Oststeinbek) 10,4,5,19; 6. Sven Lindstädt / Philip Boll (Norderstedt) 6,5,8,19. Kielzugvogel: 1. Herbert Kujan / Christian Kujan (Marktoberdorf) 3,4,2,9; 2. Alexander Antrecht / Antrecht Klaus (Neustadt) 7,3,1,11; 3. Jens Liebheim / Thomas Kindermann (Essen) 11,1,4,16; 4. Fischer Axel / Martina Stemmer (Stuttgart) 5,8,5,18; 5. Wolfgang Emrich / Klaus Ebbinghaus (Geltendorf) 8,12,3,23; 6. Michael Hotho / Uwe Lätzsch (Wunstorf) 18,7,7,32. 29er: 1. Mads Emil Lübeck / Christian Peter Lübeck (USA) 2,(6),1,1,1,5; 2. Fizulic Domagoj / Basic Tomislav (CRO) 2,2,2,(3),1,7; 3. Justus Schmidt / Max Boehme (Schönwalde) 1,3,3,1,(4),8; 4. Jule Goerge / Lotta Goerge (Kiel) 1,(25),2,4,5,12; 5. Vera Maag / Bärbel Maag (Albstadt) 3,2,5,2,(14),12; 6. Christian Kirketerp / Mathias Sletten (DEN) 4,7,1,2,(16),14. Contender: 1. Bjarke B. Johnsen (DEN) 4,2,7,2,15; 2. Sören Andreasen (DEN) 3,9,5,1,18; 3. Jacob Lunding (DEN) 10,1,3,6,20; 4. Michele Benvenuti (ITL) 1,6,12,4,23; 5. Jan von der Bank (Eutin) 2,11,14,3,30; 6. Karsten Kraus (Schwedeneck) 7,7,10,11,35. Farr 40s off Porto Cervo, Sardinia. Supplied image. The ten crews competing in this first leg of the Farr 40 European Circuit got in their first race in light and shifty conditions today. Massimo Mezzaroma’s Nerone, with Vasco Vascotto calling tactics, dominated from the off and rounded the first leeward mark ahead of Fiamma, with tactician Ray Davies, and Plenty, owned by Alexander Roepers following. 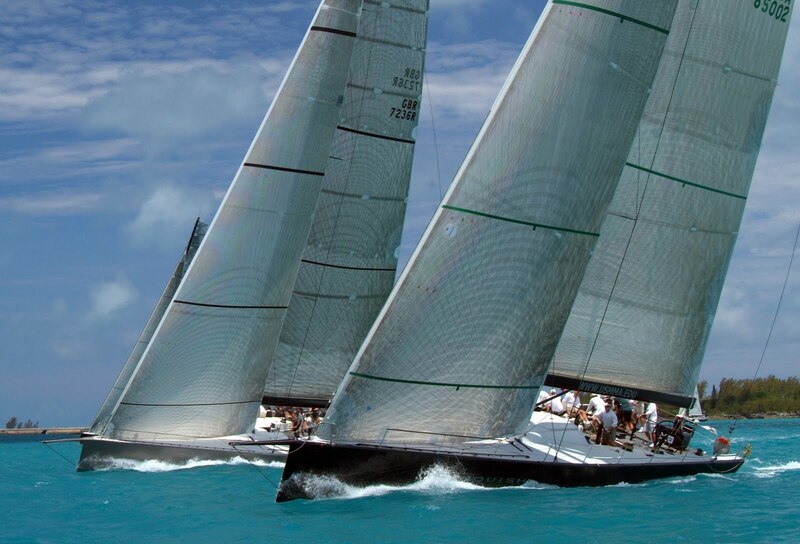 Nerone, fresh from winning the class World Championship in April of this year, held her lead to the finsh line while Fiamma lost ground, leaving Plenty in second place and Enfant Terrible, with Pietro D’Alì aboard, in third. Racing is scheduled to continue tomorrow, Saturday 26th, at 12 midday with 6 to 8 knots of east south-easterly breeze predicted. The Race Committee will hold as many races as possible. Torpyone. Image copyright Guido Trombetta/B Plan. 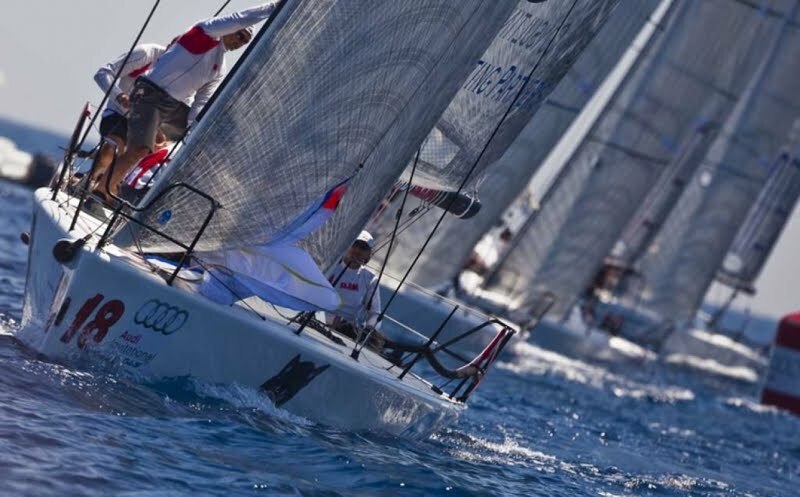 Racing got underway today in the Audi Invitational Melges 32 regatta with racing held in 5 – 8 knots of shifty breeze. The event, organized by the Yacht Club Costa Smeralda from 25th to 27th June, sees the participating crews compete both for the Audi Invitational Trophy and the third leg of the Audi Melges 32 Sailing Series 2010. Image copyright Guido Trombetta/B Plan. Today’s light conditions meant that the fleet only managed to complete one windward-leeward race which was started in 5-6 knots of breeze from 010° on schedule at 12 midday. An early leader and first around the leeward mark was Edoardo Lupi’s Torpyone with Branko Brcin calling tactics. Torpyone was followed by Carlo Alberini’s Calvi Network, B Lin Sailng.com and Brontolo. Torpyone held her lead right to the finish while Calvi Network lost ground to finish fifth. B Lin Sailing.com took second place ahead of Filippo Pacinotti’s Brontolo in third leaving the top of the leader board dominated by Italian teams. Fleet downwind. Image copyright Guido Trombetta/B Plan. The Audi Invitational, now in its seventh edition, will be disputed tomorrow in a one-off, out of circuit race where each boat will have a national celebrity as a “sailor for a day” guest. 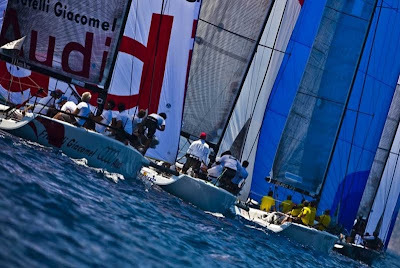 Racing will then continue for the series with the YCCS Race Committee looking to fit in the maximum of three races permitted daily in accordance with the rules of the regatta. This evening title sponsor Audi has invited owners, crews and VIP guests to a gala dinner at the YCCS Clubhouse. Racing is scheduled to continue tomorrow, Saturday 26th, at 12 midday with 6 to 8 knots of east south easterly breeze predicted. Evidently people are looking forward to the start! The Tour de France à la Voile starts tomorrow (Saturday) at 10:30 with training and a practice race. 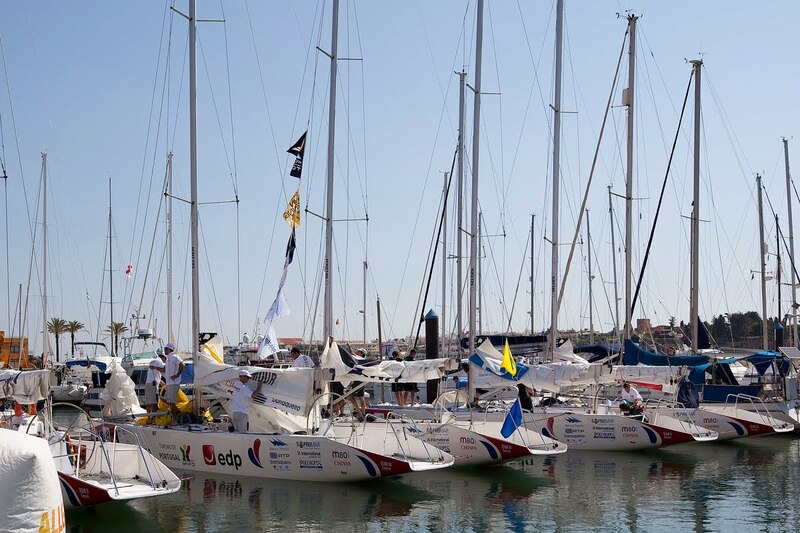 But, for the moment, the Farr 30s are moored in front of the quai des Hollandais in Dunkerque and the 28 teams are occupied with sorting the last details. Some teams have been at sea for some hours; others stayed on land to tie things up, mark the shrouds and give the boat a final clean. Measurements, briefings and do-it-yourself: this is the price of a month of racing to come! And the very beautiful weather on the Opal Coast makes the preparations easier. What is most surprising is to hear the languages spoken in every corner of the pontoons. Americans (Groovederci), Omanis (Oman Sail), Swiss (Ville de Genève – Carrefour Prévention, Bienne Voile – SRS I and SRS II), Belgian (Région de Bruxelles – Capitale), or Dutch (TU Delft, Brunel and Mummaduck): there are nine foreign participants. A third of the fleet! This is good proof of the international interest surrounding this annual event. And for the internet surfers, Virtual Regatta has the virtual Tour de France à la Voile for the second year running. Three stages: Dunkerque - Lorient, Lorient - Port Camargue (passing through Gibraltar) and Port Camargue - La Seyne sur Mer (passing Corsica). 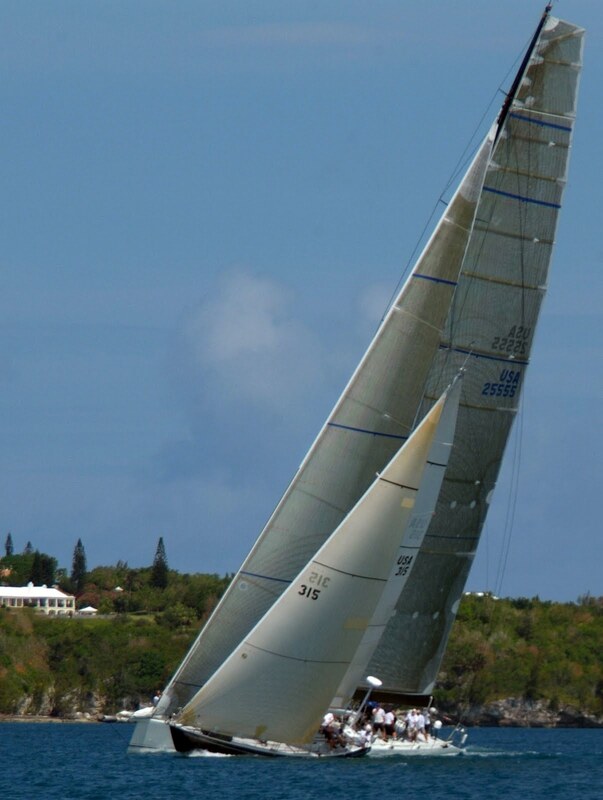 An information race which permits each player to race his own TFV in a Farr 30. To sign up and participate - free! - all that is necessary is to click on the link on the right-hand side at the bottom of the welcome page of www.tourvoile.fr More than 11,000 skippers have already signed up, and the start will be on Monday 28th June at 1500 hours. Watch out for the amateurs! "It is a good year! We have 28 boats at the start and the teams present are extremely competitive. There are new people and that is good to see - the Omanis, the Americans,... In my opinion, they will give a nudge to the traditional top people in the discipline, such as Daniel Souben or Jimmy Pahun. That will make for a good fight! "It is beautiful weather - I would not think that we are in Dunkerque! It is very different from that we had when we last participated in the TFV, in 2004. We are almost ready - 2 hours' work, perhaps - and will try to get out to sea today. What am I expecting of this 2010 edition? I want to have fun! I love sailing and it is for that reason that I am here." "We have trained since January, but not since our arrival in Dunkerque. We shall wait until tomorrow to go on the water! We are studying the list of those entered. It will be hard, very tight, but we really want a podium position. Our strong points? Cohesion, because we are all in the same three schools. We have known each other for two years." "The first part of our team arrived on Monday at lunchtime; they made camp and put the boat in the water. We put the mast up on Tuesday. Wednesday, we made adjustments, and the rest of the team arrived yesterday and today. Only the last details remain - mark-ups and electronics... We are certainly ready! Our objective? The podium. We were second last year, our team remains the same, and we have had a an even better early part of the season. We will do our best and we will see what will happen!" Evidemment, on a hâte que ça démarre ! Le Tour de France à la Voile commence demain à 10 heures 30, avec un entrainement suivi d’un prologue. Mais pour le moment, les Farr 30 sont amarrés devant le quai des Hollandais de Dunkerque et les 28 équipages s’occupent de régler les derniers détails. Certaines équipes sont sorties quelques heures en mer ; d’autres sont restées à terre pour poser les autocollants, marquer les écoutes et donner un dernier coup de propre. Contrôles de jauge, briefings et bricolages : c’est le prix du mois de régate à venir ! Et le grand beau temps qui s’attarde sur la Côte d’Opale facilite ces préparatifs. Ce qui surprend le plus, c’est d’entendre parler toutes les langues dans chaque coin de ponton. Américains (Groovederci), Omanais (Oman Sail), Suisses (Ville de Genève – Carrefour Prévention, Bienne Voile – SRS I et SRS II), Belges (Région de Bruxelles – Capitale) ou Hollandais (TU Delft, Brunel et Mummaduck) : ils sont neuf concurrents étrangers. Soit un tiers de la flotte ! Jolie preuve de l’engouement international autour de l’épreuve estivale. Et pour les internautes, Virtual Regatta propose de disputer un Tour de France à la Voile virtuel pour la deuxième année consécutive. Trois étapes : Dunkerque – Lorient, Lorient – Port Camargue (en passant par Gibraltar) et Port Camargue – La Seyne sur Mer (en passant par la Corse). Une course informatique qui permet à chacun de disputer son propre TFV en Farr 30. Pour s’inscrire et pour participer – gratuitement ! -, il suffit de cliquer sur le lien en bas, à droite de la page d’accueil du site officiel, www.tourvoile.fr. Plus de 11 000 skippers ont déjà répondu présents, et le départ est prévu lundi 28 juin à 15 heures. Avis aux amateurs ! "We are very pleased to have received the draft form of the Protocol for the 34th America’s Cup last night. It is a very detailed document and so will take us some days to digest and discuss internally. TEAMORIGIN very much wants to be involved in the process of moving this draft forward into a final Protocol document by the 31st August 2010 and therefore we will collate our thoughts and feedback over the next week and input our comments. The document has been based in some areas on the AC32 Protocol, with some new additions. We do have some concerns but will voice them directly to GGYC. We are very encouraged to see that GGYC and Club Nautico di Roma are keen to empower and include the future potential challengers in this process as we move forward." 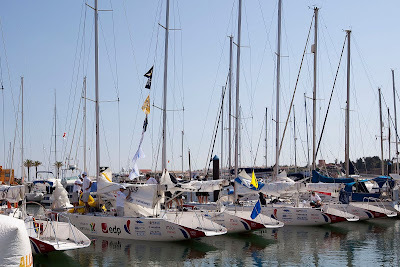 The fleet of SM40s at Portimao Portugal Match Cup 2010. World Match Racing Tour. Portimao, Portugal. 23 June 2010. Image copyright Gareth Cooke/Subzero Images. The 4th leg of the Tour has a fleet of Swedish Match 40 race boats which are a real favourite with the teams. Designed by Pelle Petterson, creator of the America’s Cup challenger ‘Sverige’, these 40 footers bear a striking resemblance to a Cup Class sloop with their slab sided, narrow style and large sail plan. Torvar Mirsky (AUS) Mirsky Racing Team who won Portugal Match Cup last year understands the importance of using yachts that are customised to the specific racing discipline, "The Swedish Match 40 was designed for match racing, it's sort of a miniature AC boat". The cockpit is wide open and runs nearly half the length of the boat. Crews find this model particularly physically demanding so fitness training is critical before this event. Francesco Bruni (ITA) Azzurra is also a fan of the SM40 race boats at Portimão, “They are well maintained and in good shape, very different to the Korean boats and much heavier, we know them from the past”. The SM40s provide sufficient performance to be interesting to both spectators and sailors alike, but at the same time are easily maintained and inexpensive to build. This is a perfect balance for the industry authority on premium match racing. One event down, four to go until the 2010 Extreme Sailing Series Champions will be crowned in Almería, Andalucía, Spain, but for those that didn't manage to join the crowds in their thousands in Sète, France for the opening event of the 2010 circuit, they can watch all the action on Bloomberg TV across Europe this weekend, and on Dahlia Sport in Italy. The programme will also be shown in New Zealand at a later date, on Sky Sports. At 1530 (local) on 26 June (repeated at same time on the 27th) across Europe including UK, France, Spain, Italy and Germany, Bloomberg TV will broadcast the first of five programmes about the 2010 circuit. Dahlia Sport in Italy will broadcast at 1925 (local) on 26 June, repeated on the 30th at 2230. Produced by Sunset&Vine|APP, the programme features all the on-water action which saw Yann Guichard's Groupe Edmond de Rothschild win the opening event in definite style with one race to spare. A behind the scenes look at the two teams from Oman Sail reveals that despite being the closest of rivals on the water, they share tactics and experience in joint-coaching sessions off the water and how the removal of multihulls from the Olympics has benefitted Mike Golding's Ecover Sailing Team. 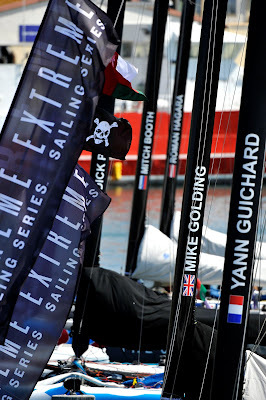 Extreme 40 masts, Extreme Sailing Series 2010, Sète. Image copyright Vincent Curutchet/DPPI/OC Events. The 25 minute programme will be broadcast internationally across 24 networks, reaching 120 countries in 13 languages. The five-part series will be aired on channels including Sky Sports (UK, New Zealand, Ireland), Sport + (France), Fox Sports (Australia), CNBC (pan-Europe) and Al Jazeera (Middle East) as well as in-flight onboard five airlines including Air France, British Airways and Lufthansa. Day 1 of The Superyacht Cup Palma 2010 dawned clear, bright and ominously still. Nevertheless, the diverse fleet, which features this year many yachts familiar to superyacht racing fans, representing yacht builders worldwide, including Holland Yachtbouw Shamoun, Fitzroy’s Salperton IV, Royal Huisman Gliss, Wally Saudade, and of course, the unmistakable Maltese Falcon, built by Perini Navi, joined by her baby sister, P2, left the port before mid-day, hoping for the usual daily afternoon breeze to kick in. Yet in the end, the Wind Gods did not disappoint, so with only a short delay, the racing kicked off at 13:30, as Drumfire led the fleet with a clean start. It was a long day on the course, with all of the yachts bringing home their tired sailors long after cocktail hour should have started, yet once again, Jim Teeters proved he’s at the top of his personal game, with finishes for the fleet of 21 yachts coming in within only a sixty-three minute gap. 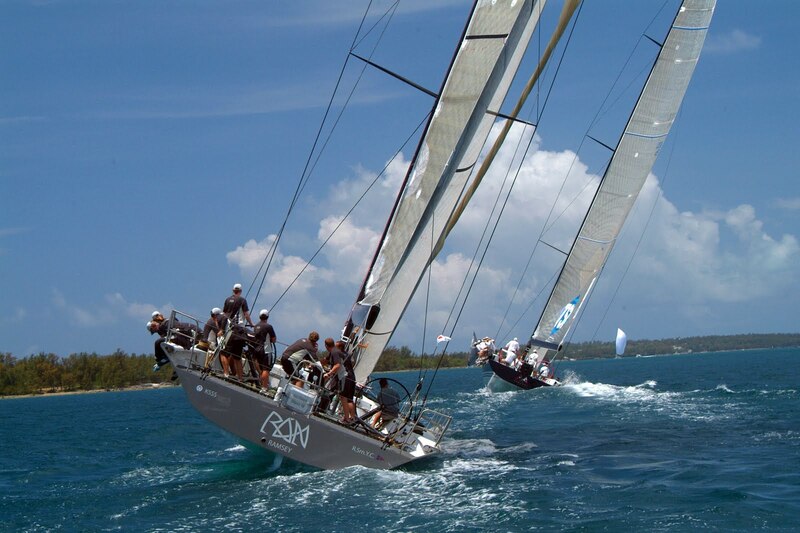 The race was called by SYC’s newest star, the well-known American sailor Peter Craig, who took to the airwaves as professional Race Officer, having participated in the SYC 2007 onboard Meteor. The entire crew of Scorpione dei Mari, clad in their distinctive acid-green shirts augmented by a variety of Cowboy and Indian paraphernalia, joined the large group of fellow Superyacht Cup racers, sponsors and press to celebrate long into the night with The Yacht Report Group and MTN Satellite Communications sponsored Western-themed barbecue, which was enjoyed by one and all. Once again, the newest location of the SYC Palma proved a roaring success, as cowboys and cowgirls, sherrifs and indians danced up a storm under the tent, illuminated by bright moonlight. 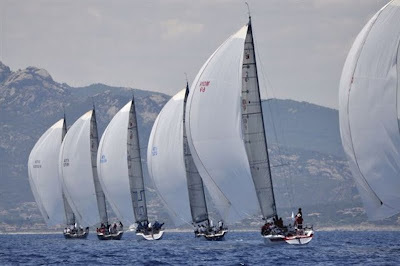 All is set in Porto Cervo for the start of racing tomorrow in two events being organized simultaneously by the Yacht Club Costa Smeralda (YCCS). 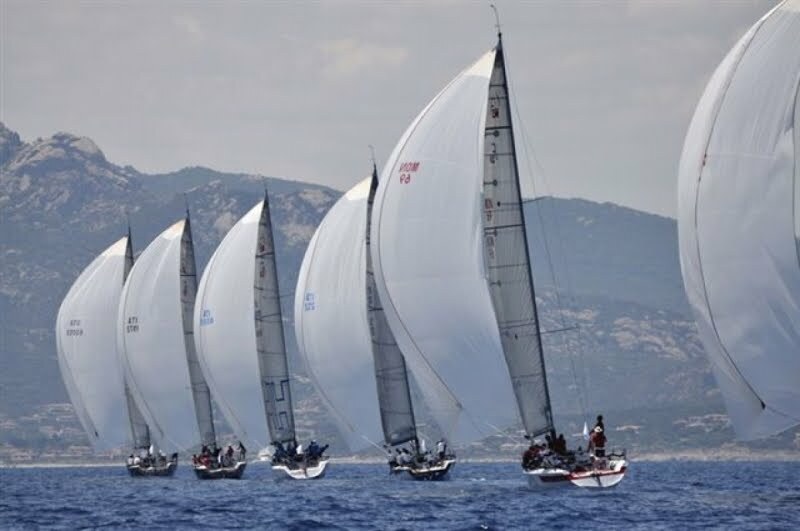 Sixteen Melges 32 craft will compete in the Audi Invitational Melges 32 regatta from 25th to 27th June while ten Farr 40s will be racing in a leg of the Farr 40 European Circuit on the same dates - and on the same regatta course - off the north eastern coast of Sardinia. Both fleets return to Porto Cervo and the YCCS after having disputed their respective world championships there in 2009. 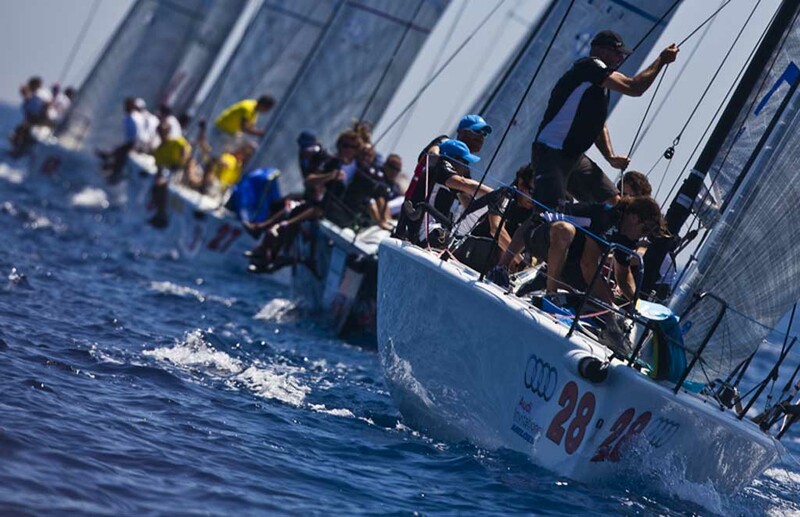 Audi Invitational Melges 32. 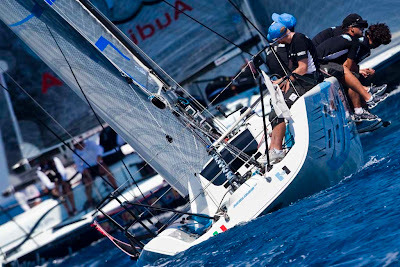 Racing is scheduled to begin at 12 midday tomorrow in this penultimate leg of the Audi Melges 32 Sailing Series. The majority of the fleet is Italian but the Czech Republic, Germany, Monaco, Netherlands and the United Kingdom are also represented. Italian competitors include Lanfranco Cirillo’s Fantasticaaa and Luca Lalli’s B Lin Sailing.com, currently placed first and second respectively in the 2010 Audi Melges 32 Sailing Series classification. Saturday 26th June will see national celebrities from the world of sport and television as guests aboard the boats in a race which will decide the winner of the Audi Invitational Trophy before racing continues for the series. As is traditional in events organized by the YCCS in collaboration with title sponsor Audi, a rich social programme will complement the sporting schedule. Owners and crews will enjoy a welcome cocktail at the Clubhouse following the Skippers’ Briefing and a gala dinner on the YCCS Pool Terrace tomorrow in addition to daily after race refreshments in the Piazza Azzurra. The final prize giving will take place on Sunday 27th June at 6 p.m.
Farr 40 European Circuit. The Farr 40 fleet has been competing for over ten years and the crews competing in Porto Cervo this weekend boast some top-class yachtsmen such as round the world sailor Pietro D’Alì aboard Enfant Terrible and match racer Chris Larson aboard Plenty. The first starting signal for this class is also scheduled for 12 midday and the YCCS Race Committee will hold as many races as possible each day up to a maximum of eight for the series. The prize giving for the Farr 40 European Circuit is scheduled to take place on Sunday 27th June at 6 p.m.
Adam Minoprio on day 1 of Portimao Portugal Match Cup 2010. 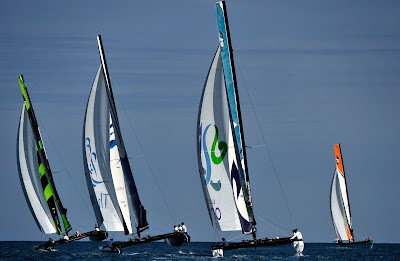 World Match Racing Tour. Portimao, Portugal. 23 June 2010. Image copyright Gareth Cooke/Subzero Images. Following a long day off the water waiting for the evening seabreeze to roll in, BlackMatch were only involved in one race and managed to take a win over the Russian Synergy Team, maintaining our unbeaten record here in Portugal. We are currently at the top of the table and with the event now pushed for time, an added incentive for holding on to the top position is the fact that the top qualifier will proceed directly to the semi final, while only 6 other teams left to fight it out in a shortenened quarterfinal. BlackMatch would like to thank their sponsors FedEx Express and Events Clothing/Line 7 New Zealand. We would also like to thank our new sponsor Steinlager Pure and Emirates Team New Zealand, as without their support we would not have this opportunity. A good result after a long day of waiting for YANMAR Racing. Australian Peter Gilmour and his YANMAR Racing team consisting of Cameron Dunn, Thierry Douillard, Yasuhiro Yaji and Kazuhiko Sofuku today sailed just one race today in this fourth event on the 2010 ISAF World Match Racing circuit. It was 19:42 and there was a sharp sea breeze gusting to 16 knots as YANMAR Racing went into the starting box against Ian Williams (GBR) Team GAC Pindar. Williams was still chasing Gilmour back towards the line as the gun fired; Gilmour started well in control. After four quick tacks Gilmour held on port and headed for the beach and the right-hand side of the course. On the first cross Gilmour was well ahead and YANMAR Racing rounded the top mark comfortably ahead of Williams. At the bottom of the run YANMAR Racing took the right hand mark and headed back towards the beach. At the top mark for the final time, they were almost ten lengths ahead of the British crew and crossed the line for an important win, just on 20:00 local time. Peter Gilmour was smiling. 'A good match for us this evening. Our bowman Fuku (Kazuhiko Sofuku) did an excellent job with the timing and we were right on the button. 'Cameron (Dunn) sent us to the right where there was more pressure and next time we crossed we were five lengths ahead and it was game over. 'We started late, but we had good sailing conditions with that firm sea breeze. These Swedish Match 40 boats are very demanding on crew work but reward good sailing, you need to keep them thumping along. 'We are doing reasonably but there is a fair way to go. We just need to get through to quarter final stage and onwards and upwards from there. After waiting patiently for the wind to settle in, MRT’s dominant form shone through going through the day undefeated. Once again racing was delayed as the seabreeze couldn’t settle in, and the teams were left to soak up the sun in this picture perfect arena. The racing wasn’t quite so easy however, with Team Azzura’s Francesco Bruni looking to draw the day’s first blood. Both teams were pushing to the limits to get the advantage off the line, and finding some speed, MRT managed to force Azzura to tack off to the unfavoured side, and with this slight advantage the Australian’s managed to lead through to the finish. The final race of the day saw a rematch of the Korea Match Cup semi finals with MRT seeking revenge on the French Match Racing Team, lead by Mathieu Richard. A feisty prestart saw MRT lead marginally off the line after a daring stunt by skipper Torvar Mirsky got them in front. “It was pretty touch and go as to whether we were going to fit in the small gap between Richard’s boat and the committee boat, but luck was on our side and the boys did a pretty good job to get us up to speed without getting a penalty” said Torvar Mirsky after the day’s racing came to a close. Mathieu Richard (FRA) leads Manuel Weiller (ESP). Image copyright Subzero Images. Day Two at Portimão brought yet more sun and an afternoon wind stabilising later than yesterday, which again swung right into position from the West and generated some waves for the sea sailors amongst the fleet. The race course has changed the fortunes of some of the top runners with surprising scenarios playing out. Mathieu Richard (FRA) French Match Racing Team lost 2 matches in a row and now sits at 3-2, with Francesco Bruni (ITA) also finishing on 3-2 having been beaten by Magnus Holmberg (SWE) Victory Challenge with Bruni having a half point deducted after a collision that resulted in damage. Torvar Mirsky (AUS) Mirsky Racing Team and Adam Minoprio (NZL) ETNZ/BlackMatch Racing, the youngest Tour seeds, sit in the most comfortable positions at 4-1 and 4-0 respectively. Minoprio is still the only unbeaten skipper in Stage 4’s Round Robin. Maguns Holmberg (SWE), crewed by the Kiwis from Waka Racing, ahead of Francesco Bruni (ITA), at the Portimao Portugal Match Cup. Image copyright Subzero Images. Francesco Bruni and his Azzurra team in Portugal. Image copyright Subzero Images. Day three will provide plenty of sporting stimulus to the Poritmão region with Portugal due to play Brazil in the Football World Cup and the final stages of the Round Robin putting further pressure on all entries to make the cut through to the Quarters. Cowes Week Limited (CWL) is delighted to announce that Artemis Investment Management, one of the UK's leading investment companies with a strong association with Cowes Week over the years, has signed a major boat branding sponsorship package for Cowes Week 2010. The Artemis logo will appear on the bows of the Cowes Week competing boats, providing the company with significant brand exposure at the world’s best-known sailing regatta. This new deal is part of Artemis’ wider new commitment to British sailing that has just been announced, and the new source of investment in Cowes Week benefits everyone competing this year by ensuring that entry fees are maintained at 2009 levels. Artemis will also, once again, be sponsoring the pro-celebrity “Artemis Challenge” during Cowes Week; the competing IMOCA 60 monohulls will race 50 miles around the Isle of Wight on Tuesday, 3rd August. The race, now in its fourth year and the only annual UK-based IMOCA race, will feature some of the biggest names on the offshore racing circuit who will be joined onboard by celebrities from the world of sport and television attracting wide media coverage as well as benefiting the charities of the competing boats. 18 06 2010 Marseille Trophy - Audi MedCup Circuit © Ian Roman/Audi MedCup. Audi MedCup Circuit organisers, World Sailing Management, today introduced the Camper brand as official sponsor of the Conde de Godó Trophy - Barcelona, the third event of the 2010 season. “We at Camper hold a special and strong regard for the sport of sailing, we are tremendously international, but we are from Mallorca originally. 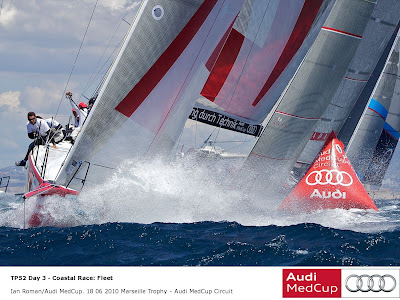 The Audi MedCup Circuit is an event which shares many of our values." continues Carpio. The Audi MedCup Circuit has maintained a close relationship with the international shoe manufacturing brand. Camper was official supplier on the Circuit in 2007, the same year in which they sponsored the Copa del Rey Camper Audi, the third event of the 2007 MedCup season. “ Given the strong relationship Camper has with sailing, with the Audi MedCup Circuit and particularly with the city of Barcelona, we are very happy to be collaborating again." concludes Ignacio Triay, Audi MedCup Circuit Director. The Regata Camper - Conde de Godó Trophy - Barcelona will take place from July 20th to 25th. The Public Village for the third event of the season will open on July 17th and remain open with free entry through to 25th July. 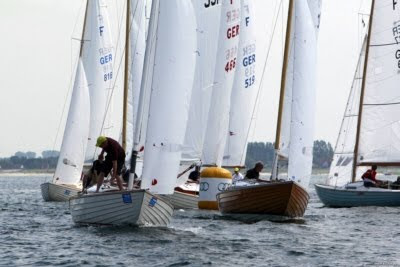 Folkboats in their first race at Kieler Woche 2010, © segel-bilder.de /Christian Beeck. Unfortunately again low winds for the beginning of the second part of the Kieler Woche with 14 international classes at the start. No races for most of them. Only the Folkboat, Platu 25 and the J 24 found enough wind to finish one race. Note from SailRaceWin: A different nationality won the first race in each class! Russell Coutts and Vincenzo Onorato with the Auld Mug at the first press conference of the 34th America's Cup in Rome. Image copyright Guilain Grenier/BMW ORACLE Racing. Foremost amongst numerous innovations is a forward-thinking structure that allows funds and assets to transfer from one America’s Cup to the next. The draft is a ‘listening and living’ document. Teams have been invited to comment and, contribute to its final form. “This has been a painstaking process, but we believe it sets out a New Deal for the America’s Cup and fair play for all teams. It also incorporates the vision of the Cup held by Larry Ellison and BMW ORACLE Racing,” said Russell Coutts, CEO of BMW ORACLE Racing. Building on the initiative by the World Sailing Teams' Association, a maximum of eight pre-regattas per year is planned for consistent racing and exposure for the teams in the years leading up to the America’s Cup. The Protocol will rein-in costs by reducing the number of racing crew, introducing no-sailing periods and limiting the numbers of hulls, masts, appendages and sails teams can build. At the end of the 34th Match, the New Deal leaves an inheritance of substantial funding and assets to the next Defender in a move to end the stop-start cycle teams have faced previously. This sustainable legacy is dependent of the 35th America’s Cup defender continuing with neutral race management and a schedule of regular competition. In keeping with GGYC’s pledge of fair-play for all, among the many measures which will achieve this is a commitment that GGYC’s defender will not will not compete in the final Challenger Selection Series but that there will be defense trials if there is more than one viable US team. Progress on a new, exciting and physically-demanding class of America’s Cup yacht, again with a dialogue with stakeholders fundamental to the process, is moving strongly ahead. Fransesco Bruni leads Bjorn Hansen on day 1 of Portimao Portugal Match Cup 2010. World match Racing Tour. Portimao, Portugal. 23 June 2010. Image copyright Gareth Cooke/Subzero Images. Portimão Portugal Match Cup, Stage 4 of the 2010 Tour, has attracted some of the world’s most experienced and talented crews to the Algarve. Mathieu Richard (FRA) French Match Racing Team has been racing with some of his team for over 10 years which he cites as a key asset in teamwork. Richard’s core crew are Olivier Herledant, Greg Evrard and Yannick Simon who are dedicated to the WMRT events this year, with new for Portimão Devan Le Bihan. Adam Minoprio (NZL) ETNZ/BlackMatch Racing has been on the Tour travelling the globe with his close knit Kiwi team including; Tom Powrie, Nick Blackman, Dave Swete and Dan Mclean for the last two years. This group of young ambitious guys, who for some have chosen to base themselves in the UK, are enjoying their last bitter sweet year on the Tour with the current ISAF Match Racing World Champion. Minoprio has been signed up for the 2011 Volvo Ocean Race with ETNZ and will be moving to offshore style training next year. Dashing Englishman Ian Williams (GBR) Team GAC Pindar has a new team line up for 2010 that has worked effectively since Stage 2. Williams is joined in his travels by 3 fellow Brits; Simon Shaw, Mark Williams and Richard Sydenham (now based in Sweden) as well as Tasmanian born Malcolm Parker. Ian has chosen to race with his brother Mark again, who was part of Williams’ 2007 winning World Championship Team, showing that siblings can make effective race teams. Torvar Mirsky (AUS) Mirsky Racing Team is the youngest of the Tour card holders. He has picked a multinational team with Australians Kyle Langford and Graeme Spence, Welshman Tudor Owen and New Zealander Kinley Fowler. This team much like the manufactured music groups of our time have all been selected due to their unique talents and have been moulded into one powerful dynamic. Magnus Holmberg (SWE) Victory Challenge has chosen a young and hungry team for his 2010 Tour events. Holmberg only met Brad Farrand, one of his crew, for the first time on site at Portimão this week. He is backed up by another 3 physically conditioned crew, from the Kiwi Waka Racing team - Sam Bell, James Williamson and Garth Ellingham. Francesco Bruni (ITA) Azzurra has some top names from the Azzurra America’s Cup Team with him this week; Pierluigi De Felice, Matteo Auguadro, Tom Burnham and Ben Durham. Matteo, bowman for Bruni, in 2009 alone notched up 2nd at the Congressional Cup, 3rd at the Farr 40 Worlds, 1st on the Rolex Fastnet with another win at the Maxi Yacht Rolex Cup. Tom, originally from the US, has raced with America’s Cup Challenges Prada and Luna Rossa. Artemis Ocean Racing, Pindar & Arena IMOCA 60's racing in the Artemis Challenge 2009, © Lloyd Images. Artemis Investment Management today announced their continued support of British sailing in 2010 across all levels from grass roots to fully professional ocean racing. This new commitment establishes Artemis as one of the longest and most significant existing supporters of British sailing. Artemis Offshore Academy: Artemis will support a UK training programme of excellence for British short-handed sailors, providing a structure to bring talented sailors up through the ranks. Designed to help them win major offshore solo and short-handed races in the future, the ultimate goal is to put a British sailor in a strong position to win the Vendée Globe in 2016 or 2020. Artemis will continue their support of solo offshore sailor Jonny Malbon for this season and the first intake into the Academy will be competing for a scholarship to undertake a Figaro campaign. Mini campaign: as part of the Academy programme, Artemis will provide a ‘race ready’ boat if an appropriate British sailor with proven potential is forthcoming to compete in this season. 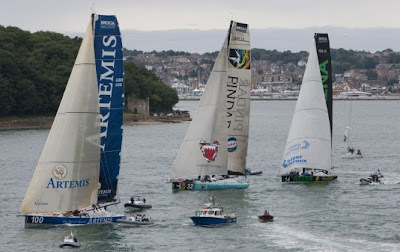 Cowes Week 2010: Artemis will support Britain’s best-known sailing regatta this year in a partnership that will see competitor entry fees remain at the same level as 2009. They will also continue their support of the Red Arrows display on the final Friday, a spectacle enjoyed by thousands on and off the water. Artemis Challenge 2010 confirmed: A successful event since 2007, and the only annual UK-based IMOCA race, the Artemis Challenge will feature an A-list of offshore racers and celebrities on 3rd August. IMOCA 60: After 4 years of IMOCA 60 racing, Artemis Ocean Racing’s IMOCA 60 will compete in races to benefit up and coming talent, as well as the Artemis Challenge, but will not compete in the major IMOCA events at the end of the year. The boat will go on the market by the Autumn. Since 2006 Artemis Ocean Racing has been active in the highly competitive IMOCA 60 class, competing in solo and double-handed races, building a radical new IMOCA 60 yacht, and entering the tough solo Vendée Globe non-stop round the world race. In addition to the sailing team, Artemis has also supported a number of IMOCA 60 events including The Artemis Transat 2008 and the annual Artemis Challenge, as well as supporting the Even Keel charitable project that utilises the Artemis 20 boat, designed for disabled sailors and used by Hilary Lister in her round Britain voyage. Artemis Investment Management will now continue to support a number of initiatives from the grass roots up to fully professional racing in 2010. The next phase will concentrate on a long-term commitment to British solo sailing talent, with the objective to propel young British offshore solo talent to the fore. With a long-term aspiration of putting a British sailor in a position to win the solo Vendée Globe in 2016 or 2020, the Artemis Offshore Academy is being formed to secure a pipeline of up-and-coming sailing talent. The Academy will provide a structure that can help all whose potential is yet to be fully realised. An Advisory Board has been established to oversee the creation of the Academy with the objective of defining the selection and training process. The Advisory Board will consist of 6-7 ‘industry’ non-executive directors including Rod Carr (ex-RYA Chairman); two leading current short-handed sailors; Gilles Chiorri (OC Events Director and former top Figaro sailor); Edward Gorman (former sailing correspondent, The Times, now Deputy Foreign Editor); and Mark Turner (OC Group CEO) who can provide the necessary guidance and expertise. The Advisory Board will also start the process of recruiting the best coaches and mentors for the programme having studied and experienced the French training schools in Port La Foret and Le Grande Motte where Jonny Malbon has been training all winter for this year’s Figaro season. The Artemis Offshore Academy will operate from a variety of bases to maximize the effectiveness of the training in British waters during the summer, including the Weymouth & Portland Sailing Academy, and in the South of France, La Grande Motte, already an established French Figaro school, in the winter. Four Figaro One-Design boats have already been purchased and are being refitted at OC’s Cowes base. • Development Squad of 8-12 sailors training on the Figaro boats, developing skills and able to qualify for the ‘Scholarship’ programme in the Figaro Class or Mini. • Associate Sailors who have managed to get funding for their own campaign, may own a Figaro themselves, but who would benefit from the Academy’s coaching programmes. • Ambassador Sailors who are already competing on the international short-handed stage but can benefit from being part of a knowledge sharing and coordinated training programme and, ultimately, assist in the career development of the next generation of short-handed sailors. The aim is to have the first trainees on site from September with up to a dozen students training full-time and others on part-time or specific training modules. A selection process will take place twice a year in spring and autumn. A shorter-term outcome of the programme will be to get the Academy trainees competing on the Figaro and Mini circuit before moving on to Class 40 and IMOCA 60 racing which is the natural progression to the top of the solo world. Another glorious sunny day in the Portuguese resort town of Portimao, the breeze came in late again but there was plenty to see and do for the waiting crews. Peter Gilmour and his YANMAR Racing team of Cameron Dunn, Thierry Douillard, Yasuhiro Yaji and Kazuhiko Sofuku had an 'interesting' start to the fourth event on the 2010 ISAF World Match Racing circuit. YANMAR Racing's first match was against Adam Minoprio (NZL) ETNZ/BlackMatch Racing, the reigning world champion. Tactician Cameron Dunn explains 'We muffed the first race, to be honest. We had the lead half way up first beat but it was very close. 'Then we misjudged our approach to the top mark. We tried to do a lee bow but we could not make it stick, they rounded the top mark ahead of us, then we collided with them, another misjudgement, which cost us 0.5 points. 'Against Eugeny Neugodnikov (RUS) Team Synergy, Peter started well. YANMAR Racing took the favoured right and had a good 30 second lead at top mark and sailed away. 'Then we sailed against Bertrand Pace (FRA) Aleph Sailing Team. Another really nice job in the start, we held the right again. Pace was just on our stern at the top mark however we extended slightly down the run and made him pay up the second beat and went on to win. SM40s in the marina at Portimao. Image copyright Subzero Images. 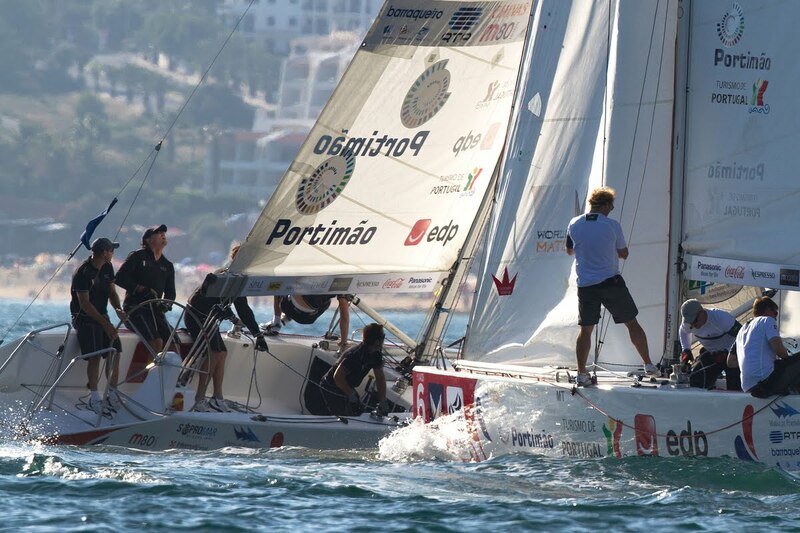 As the World Match Racing Tour kick starts its 4th event of the series in the glamorous Portugese holiday destination of Portimao, MRT finished the first day with one win and one loss. 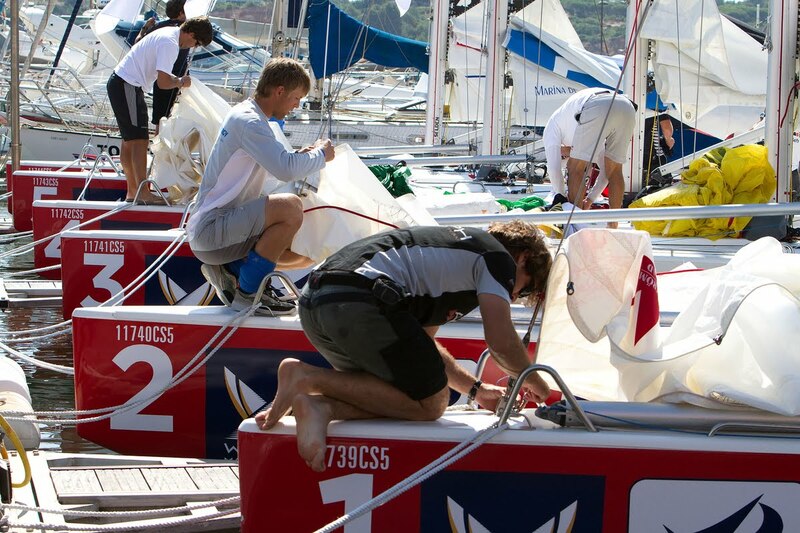 Racing was delayed this morning, giving the sailors the chance to bathe in the beautiful Portugese sun. Finally racing got underway late in the afternoon, and the event was underway in the season’s first glimpse of strong breeze. When it was MRT’s turn to step onto the boats, the wind slowly began to fade, but remained steady for their first race against Spain’s Manu Weiller. After a solid prestart, MRT managed to get to the favoured side of the course and fend off the Spaniards attacks to take their first wind. The second race against Victory Challenge’s Magnus Holmberg didn’t run as smoothly, with the Swedish Match 40 veteran sailing smart to beat the Australian team. Adam Minoprio and BlackMatch Racing make a perfect start on day one of the Portimao Portugal Match Cup. Image copyright Subzero Images. Following a disappointing 7th placing in Korea a fortnight ago, BlackMatch were back to winning form Wednesday, gaining 3 wins from 3 races in a perfect start to the Portimao Portugal Match Cup 2010. Our wins came against veteran Peter Gilmour and his Yanmar Racing Team, Betrand Pace with his Aleph Sailing team and local talent Alvaro Marinho. Portimao is new venue for the Portuguese leg of the World Match Racing Tour and it is an absolutely stunning location to have a sailing event. With sailing being held off the beautiful Rocha Beach in perfect sea-breeze conditions, this week promises plenty of exciting action. In a hard fought match against the Australian skipper Gilmour, we traded tacks in a fierce tacking duel up the first beat. Nearing the top of the course we had ground out a narrow advantage to lead into the top mark on the starboard layline. The Yanmar Team were hot on our heals directly behind when Adam did a great job of locking them out. ‘Gillie’ then went for the swing behind our stern but misjudged it horribly and there was big contact. This collision not only forced a penalty on them but after we held on to take the victory they were also ‘docked’ half a point, due to extensive damage caused by the incident. The round robin action will continue tomorrow and we are hoping to continue with the early form we have shown. Day One Portimão Portugal Match Cup © Subzero Images 2010. Top Tour seeds raced Wednesday in big bay conditions with the windward mark stationed a little over 500 metres off the entrance to Portimão Marina and 8 – 15 knots of wind which shifted round to the right by early evening round from the South West to West. Matches were run in quick succession during the day’s sea breeze splendour with the first 6 teams completing 3 flights and the remaining 6 teams racing 2 flights. Adam Minoprio (NZL) ETNZ/BlackMatch Racing convincingly won all three of his matches, with Mathieu Richard (FRA) French Match Racing Team and Francesco Bruni (ITA) Azzurra finishing the day on 2-0. Minoprio, reigning World Champion who picked up a second last year at the Portugal leg of the Tour, remains focussed on staying in top form for start time, he talked through race preparation in the Portuguese climate, “It’s very warm here, you feel like you want to enjoy the sun and go swimming, but if you stay in the heat you get dehydrated and won’t be able to focus properly for the racing, you just can’t do both”. This commitment to performance shone through today in Minoprio’s second match against Bertrand Pacé (FRA) Aleph Sailing Team who was World Champion back in 2000. Pacé led Minoprio round the course until he picked up a penalty that he just couldn’t off load by the finish as Minoprio took the advantage and lungedacross the line ahead of the passionate Frenchman. Bruni is a fan of the new Portuguese venue having won both of his matches today, “There are good conditions here in Portimão, the venue has a big potential”. Interestingly Bruni is known as a ‘light wind specialist’ but it has taken the stronger winds of Portimão to give him the edge over his competitors having beaten both Björn Hansen (SWE) Hansen Global Team and Portuguese national Alvaro Marinho (POR) Seth Sailing Team, with a 2-0 score. Richard also ends day one with a 2-0 score. He was not daunted by the prospect of stronger winds at Stage 4 saying after the Skipper’s briefing, “We like the light winds definitely and had light winds in the first stages, but I also think we can get good results in the stronger breeze”. Richard has nearly won the Tour a number of times before and has had to mount the podium but not be the overall king which is frustrating for this hugely talented European. 2010 has been a dream year so far for his team and today he once again communicated the focussed and consistent approach he uses for all events, “We are confident as we sailed well since the beginning of the year and the weather is good here in Portugal, we have those all important points and results which makes us happy. But we also feel pressure as we are the leaders and when you have a such a lead the spotlight is on you”. Bertrand Pacé (FRA) Aleph Sailing Team, Day One Portimão Portugal Match Cup © Subzero Images 2010. Tour de France à la Voile: Turmoil in Dunkerque! RTI: Three Cheers for the Round the Island Race!